Don't know how many of you have been following the current lava flow problem here on the 'big island' of Hawaii, but here's Pele, goddess of volcanoes, who reputedly lives in the Hale'mau'mau crater atop Kilauea, doing her thing. (In all fairness, that pic has nothing to do with Kilauea; it's from this 18 year old photographer. You'll find the real news on the current lava flow HERE. I didn't realize before today that most of the moving hot stuff is underground. Nobody's worried about what's underground. The red-hot stuff that's threatening the village of Pahoa (2,000 degrees F, on average) is all visible aboveground. I've been following, such as shows up to read here. Kilauea is the most active volcano on this planet. It's not necessarily violent; there is only one recorded instance of a sudden eruption that actually killed a whole passel of people. That was back in the 18th Century as King Kamehameha was fighting to unite all the islands into one kingdom and the sudden anger of Pele was widely seen as an omen that the goddess was on his side. There have been lava flows in modern times, however, that have pretty effectively wiped out whole communities. The flow of 1984 [?] pretty well destroyed what used to Kalipana. No one was hurt but quite a few people lost their homes. Kalipana today consists of a restaurant and souvenir shop and a scenic overlook. 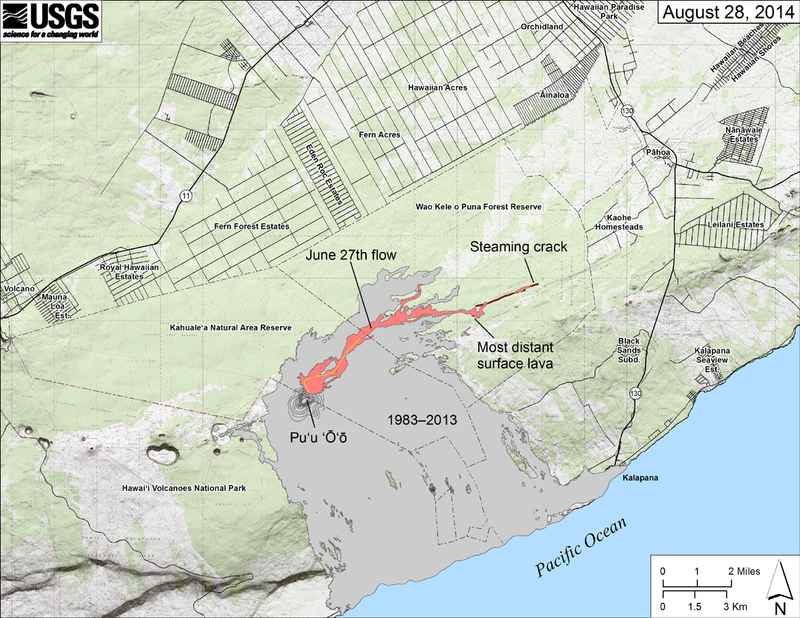 This current flow (known locally and in newspaper headlines as the June 27 Lava Flow) is actually part of a flow that started about 30 years ago and has not abated since. It's source is a vent on the side of Kilauea called Pu'u O'o. Until June 27, 2014, nobody was particularly concerned. It was, in fact, a tourist attraction. People would take a cruise ship along the coast to watch the lava come tumbling down into the ocean among huge billows of steam. But in June of this year, for reasons not very well understood, the flow changed direction. Instead of flowing makai (i.e. seaward) and plunging over the pali (cliff) it started moving toward mauka (inland) instead and heading straight toward settled areas, including the substantial village of Pahoa. Right now it looks as though by tomorrow morning it might well have reached the Pahoa Post Office and covered over one of the main access roads into the town center. A couple of gravel roads and the local cemetary are already under quickly hardening lava. As Carlin said people who build their homes on the side of a volcano with a long history of lava flows and then are shocked when lava comes through the living room are a special kind of stupid. You'd know all about that. Volcanic ash is very fertile which is why there were so many casualties in Pompeii and Herculaneum when Vesuvius erupted. And that's why so many people live in the bay of Naples. Sudden eruptions are rare, Vesuvius being a prime example, and active volcanoes like Tutu Pele tend to be slow. It's not stupid building a house on fertile land when all the indications are that any lava will flow down the other side of the mountain. ...and, of course, anyone who chooses to live in San Francisco, right over the San Andreas fault line, must be certifiably insane. This photo is from yesterday (10/29) morning. Only the leading edge, you'll notice, is red hot. It cools quickly and becomes dark grey rock. Here's a recent aerial shot showing how one street -- Cemetery Road -- has already been covered over. Oo! Date and location on that, edgarblythe? Well, this is the first home to go up in flames since June 27 when this particular flow started, More to come? Who knows. This is what the lava looks like once it has cooled (and it cools pretty fast). Just black rock (mostly basalt, I think).